This was a great week for winning souls. God gave 12 souls and several for the water this Lord’s Day. I am thrilled at the opportunity and the command to win souls. I always look at it as more than a command, but rather as an opportunity. Unfortunately there are several misconceptions and misunderstandings about personal soul winning. It’s a mistake to say that we soul win only when the Holy Spirit leads. It’s a mistake to say if we live right, people will come to us for salvation. 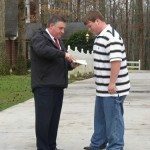 It’s a mistake to say that soul winning is just for the preacher. It’s a mistake to say just be Christlike. It’s a mistake to say men have the power to send people to Hell. It’s a mistake to think that your mission giving replaces the personal command to go soul winning. It’s a mistake to think that because soul winning is a commission to the local church that it replaces the personal command to go soul winning.